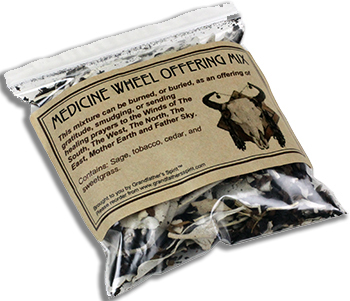 MEDICINE WHEEL OFFERING MIX: This mixture can be burned, or buried, as an offering of gratitude, smudging, or sending healing prayers to the Winds of The South, The West, The North, The East, Mother Earth and Father Sky. Contains: White sage, tobacco, cedar, and sweetgrass. Also available by the quarter pound (4 ozs.) or by the pound (16 ounces).